Remodeling a bathroom doesn’t have to take weeks and months of disruption to your daily life. Jacob Showers & Baths provides custom bath renovations that transform old, drab bathrooms into beautiful, easy to clean sanctuaries with more combinations of colors, products and remodeling expertise than any other company in the St. Louis area. All in as little as one day. Why tackle a bathroom shower renovation and risk getting in over your head with rerouting or extending shower lines, tile installation, electrical work and more? Jacob Showers & Baths makes the entire process easy. 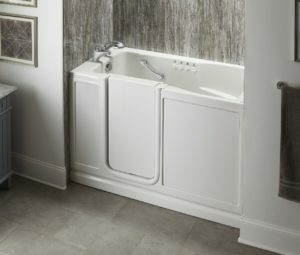 Just tell our bath consultant what you need, pick from dozens of options, let us know your color and design preferences, and we’ll take care of the rest. Before you know it, you’ll be relaxing in your new bathroom oasis! Jacob Showers and Baths makes bathroom remodeling easy with our affordable bath systems, shower systems, walk-in bathtubs, shower enclosures, and tub-to-shower conversions to create a stress free experience. With Jacob Showers and Baths, you can replace your existing shower or bath with modern, high quality materials. Our bath and shower systems are made from durable materials, meaning they won’t chip, crack or peel. All of our tub and shower options are easy to clean and naturally resist mold and mildew. You’ll be able to spend more time enjoying your bathroom, not cleaning it! 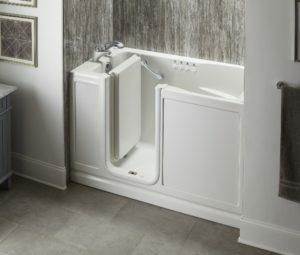 Whether you want to replace your old bathtub with a modern walk-in bathtub, or make your bathroom safer for individuals with mobility issues, a bathroom conversion is a fast and affordable way to get the new bathroom you need – without the hassle of a total renovation, and at a price that just might surprise you. Homeowners in St. Louis, Litchfield, Vandalia, and throughout Southern Illinois and Eastern Missouri contact us today and let one of our professional installers determine the perfect bath and shower options for your home. Our heartfelt thanks to a great company, to the friendly people that answer your phones, to Curt our salesman, and to the installers.